Is Masonry biblical? Why is the Lodge so secret? Does the "Craft" worship Satan? "Yes, Lucifer is God and ... The true and pure ... religion is the belief in Lucifer" (Albert Pike, July 14, 1889). The initiate "is intentionally misled by false interpretations. It is not intended that he shall understand them" (Albert Pike, Morals and Dogma, p. 819). "When the Mason learns that the Key ... is the proper application of the dynamo of living power, he has learned the Mystery of his Craft. The seething energies of Lucifer are in his hands ... Hydra, the great snake ... from its mouth pours to man the light of God" (Manly P. Hall, Lost Keys of Freemasonry, pp. 48, 54-55). "The Egyptians represented Osiris, their chief deity, by the symbol of an open eye, and placed hieroglyphics of it in all of their temples." (Albert Mackey, Encyc. of Freemasonry, p. 781) (The All-Seeing Eye). "Satan himself is transformed into an angel of light" (2 Cor. 11:14). The Lodge embraces men of ALL RELIGIONS. A Mason may not close prayers in the name of the Lord Jesus Christ as it would OFFEND Lodge brothers who are Jews, Muslims, Buddhists, Hindus, etcetera. "If Freemasonry were simply a Christian institution, the Jew and the Moslem, the Brahman and Buddhist, could not conscientiously partake of its illumination." [Albert Mackey, Encyclopedia of Freemasonry", p. 182, 33rd Degree Mason.] But the King James Version of the Bible is on the altars at Masonic Lodges. Isn't this proof that Masonry is based upon the Bible? "Masonry has NOTHING to do with the Bible; it is NOT FOUNDED upon the Bible, for if it were, it would not be Masonry, it would be something else." [The Digest of Masonic Law, p. 207-209] The Koran, Vedas, Sutras and Bible are all considered sacred texts. "Freemasonry is a search for Light. That search leads us directly back, as you see, to the KABALAH." [Albert Pike, Morals and Dogma , p. 741, Pike was a 33rd Degree Mason, Head of the Ancient and Accepted Scottish Rite of Freemasonry, Southern Jurisdiction] The Kabalah is WITCHCRAFT. Masonic philosophy is very INEXACT, VAGUE in principle and so DEVIOUS in application that it can mean almost anything to anyone. It is BABYLON. 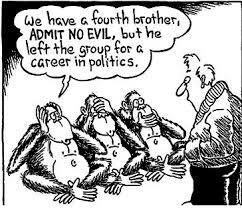 Its basic teaching method is by subtle suggestion which allows the candidate to warp his former beliefs into the Masonic framework. The cross in Freemasonry is by no means looked on as a specific Christian symbol, but is closely connected with a peculiar cult. The I.N.R.I. on the cross, to a Mason, does not refer to the passion of our Lord, but is Masonically read as, "Igne Natura Rebovatur Integra," or "All nature is renewed by Masonic fire." "Freemasonry is NOT CHRISTIAN, nor a substitute for it." [C.F. McQuaig, My Masonic Friend, p. 1] But the Bible says, "Neither is there salvation in any other, for there is none other name under heaven, given among men, whereby we must be saved" (Acts 4:12). "Be not unequally yoked together with unbelievers" (2 Cor. 6:14). Paul said that if anyone should preach any other gospel "than that which we have preached unto you, let him be accursed" (Gal. 1:8-9). "The stone which the builders (Masons) rejected, the same is become the head of the corner" (Matt. 21:42). "Aiding and Abetting" A Mason -- "Whether He is Right Or Wrong"
Most local, state and federal officials are Masons. Most US presidents have been Masons. 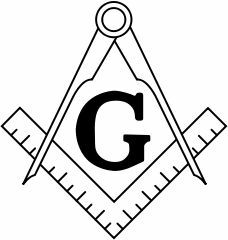 Here are a few famous men who have been Masons in the United States: Benjamin Franklin, Presidents Washington, Jefferson, Monroe, Adams, Jackson, Polk, Fillmore, Harrison, Buchanan, Johnson, Garfield, McKinley, Taylor, Pierce, Taft, Theodore Roosevelt, and Truman. Other prominent members were Lafayette, Fulton, Montgomery, Sherman, Burr, Rush, Whipple, Paine, Hamilton, Gerry, Steubon, Stark, Livingstone, Dekalb, Warren, Paul Jones, Witherspoon, Revere and Hancock. 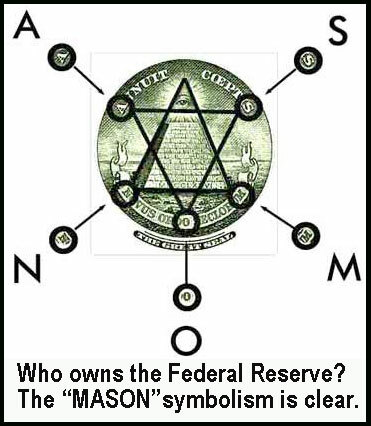 Most of these are proclaimed Masons by no lesser authority than the Encyclopedia Americana. The absolute subservience of the member of the Lodge is seen in promises such as: "to obey without hesitation, any order whatsoever it may be, of Masonic superiors ... to assist a ... Mason when he is engaged in any difficulty, and to espouse his cause, so far as to extricate him from the same, WHETHER HE IS RIGHT OR WRONG." But the Bible says, "Should you help the ungodly, and love them that hate the Lord? therefore is wrath on you from before the Lord" (2 Chr. 19:2). Don't "strengthen ... the hands of evildoers" (Jer. 23:14). "For he that biddeth him God speed is partaker of his evil deeds" (2 John 1:11). Many Masons admit that they know or have heard of brothers guilty of a crime who were never brought to trial because of their affiliation with the Lodge; and because of "aid" rendered by an official who was a Mason. Others who have been brought to trial were either acquitted by a jury containing Masons or were given light sentences. The apprentice enters the structure, symbolically, between the two columns, Jachin and Boaz, which are said to represent the two columns of Solomon's Temple (see II Chron. 3:15 ) and progresses by degrees toward perfection. 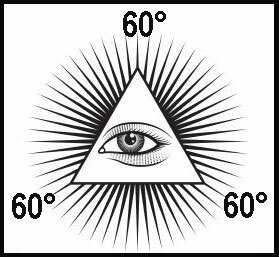 All this happens under the "All-Seeing Eye," "whom (they say) the sun, moon and stars obey and under whose watchful care even the comets perform their stupendous revolutions, (who) pervades the inmost recesses of the human heart, and who will reward us (Masons) according to our merits." (Lightfoot, page 33.) The reward supposedly comes after death releases him from this world and his soul progresses upwards toward heaven and perfection. The All-Seeing Eye is a Masonic representation of Osiris. 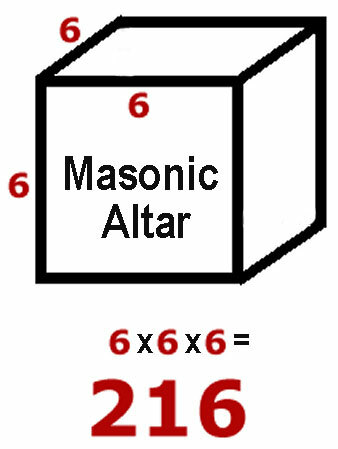 When the apprentice enters Masonry, he is compared to a rough building stone, and as the stone is shaped and polished before it is ready for use, so must the candidate become perfected during the first three degrees until he becomes a perfect stone and may be used as a building block in the house of God ( the house of God as symbolized by the Masonic Temple ). Thus perfected the Master Mason may entet into and work within the Holy of Holies. The Holy of Holies is symbolized by the central part of the structure surrounding the letter "G". The letter "G" stands for God; therefore work in all degrees from the master's up is done symbolically in the presence of God, in His most holy place. Freemasons trifle with the most solemn oaths. During the initiation ceremony, the candidate is required to solemnly swear never to reveal any of the secrets of Masonry under penalty of having his throat cut across, his tongue torn out by the roots, and his body buried in the rough sands of the sea. To add solemnity to this gruesome oath, the candidate is made to kneel before an altar with both hands on the Holy Bible. The entire program for this initiation is included in the Handbook of Freemasonry by Ronayne available thru the Ezra A. Cook Publishing Company. The oath of the Apprentice is very severe. It sears the conscience and hardens the heart. It must grieve the Holy Spirit. Here the candidate swears, without reservation, not to reveal the secrets of Masonry under the penalty of death. He does so with both hands on the Holy Bible, where the words of Christ himself say, "Swear not at all; neither by heaven; for it is God's throne; nor by the earth; for it is His footstool; neither by Jerusalem; for it is the city of the great King. Neither shalt thou swear by thy head, because thou canst not make one hair white or black. But let your communication be, Yea, yea; Nay, nay; for whatsoever is more than these cometh of the evil one," as many translations of the Bible affim (Matt. 5:33-37). Masons insist that this refers only to the use of profanity. They even make a pretext of keeping profanity out of the Lodge. The Scripture shows very clearly that profanity, as well as oaths, comes from the evil one. "Worshipful Master" is a title that belongs only to God. To call the presiding officer of a Lodge by that title is taking God's name in vain. This is not the only way in which the master of the Lodge usurps that which is God's. He is literally supposed to stand in the place of God when he stations himself under the letter "G" in the lodge room. His station supposedly represents the Holy of Holies or the throne of God. His actions while in this office are also significant. Few candidates catch on when he asks them during initiation, "In whom do you put your trust?" The answer is, "In God." Then the master says, "Give ME your right hand. Your trust being in God, your faith is well founded. Arise! FOLLOW YOUR CONDUCTOR, and fear no danger. By such words and actions, does not the master imply that the candidate is also to TRUST HIM? Then he must consider himself either an AGENT OF GOD or actually standing IN PLACE OF GOD! Certainly he does! "Who opposeth and exalteth himself above all that is called God, or that is worshipped; so that he as God sitteth in the (Masonic) temple of God, shewing himself that he is God." (2 Th. 2:4). The General History, Cyclopedia and, Dictionary of Freemasonry makes these statements in its reference to the sun: "The SUN rises in the east, and the east is the place of the Worshipful Master. As the SUN is the source of all Iife and warmth, so should the Worshipful Master enliven and warm the brethren in their work." This is even made clearer in the ceremony of the first degree when the Senior Warden informs the candidate "as the SUN rises in the East to open and govern the day, so rises the Worshipful Master in the East (here the "'Worshipful Master" rises to his feet in demonstration) to open and govern his Lodge. Masons usurp the priesthood of Jesus Christ. In the 19th level of the Scottish Rite Freemasonry, the initiate recieves the degree of Grand Pontiff. It is during this ritual that the candidate swears an oath of secrecy and an oath of total obedience "to any Chapter of this degree to which I may belong." At this time the "Thrice Puissant" anoints him with oil on the crown of his head and says: "Be thou a priest forever after the order of Malchizedek." (Scottish Rite Masonry Illustrated, "The Complete Ritual," vol. 2, pp.26-27). During the ceremonies of the ritual for the Royal Arch degree, the candidate is asked: "Brother Inspector, what are you?" and he replies: "I AM THAT I AM." Can you imagine such blasphemy? When Moses asked God to name himself, God said, "I AM THAT I AM." (Ex. 3:14). How can a man take to himself the name of God? "Is there a God beside me? Yea, I know not any" (Isa. 44:8). One might ask, "If Masonic teachings and morals are so high and pure, as Masons claim, why must they be secret?" The Lodge meets in secret and carries on business in secret. Masons answer, "Because the Bible says, 'Pure religion and undefiled before God and the Father is this: To visit the fatherless and widows in their affliction, and to keep himself unspotted from the world" (James 1:27 ). We Masons do take care of widows and orphans and we do keep ourselves apart from the world by means of secrecy." Yet the Bible says, "Let your light so shine before men, that they may see your good works, and glorify your Father which is in heaven." (Matthew 5:16). The Freemason may also remind you that Christ taught the disciples in parables to hide the meaning from the rest of the world (see Matt. 13:13). He will give this as the reason his Lodge uses secret words and symbols so that the uninformed will see or hear and not understand. Christ spoke in parables because it was not given for the world to understand. Why was it not given for them to understand? "For this people's heart is waxed gross (hardened) and their ears are dull of hearing, and their eyes they have closed." (Matt. 13:15) Why would a person harden his heart, close his eyes and refuse to hear God's laws and learn of His ways, unless he does not like them? Men have proven time and time again that they will not follow God's way or take His plan seriously. They will only do what they like best and try to reassure themselves that it has God's sanction. It is not God's plan to save the world now. He is merely calling out the "first fruits." Large scale salvation is reserved for the Millennium and Great White Throne Judgment when Christ will be here in person to supervise and rule with a firm hand. 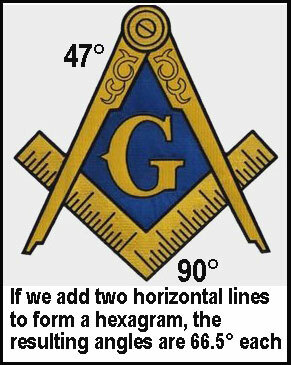 Do Masons know this? Is that why they use secret signs and symbols? No! Freemasons use secret signs because their whole philosophy is centered around giving and receiving aid from a fellow Mason to the exclusion of all others. They borrow this practice from the ancient pagans. Legendary records show that ancient pagans held public and secret assemblies in honor of their gods. The secret ceremonies and docrines were known only to those who had been iniriated and who possessed signs and tokens by which they were able to recognize each orher. It is this practice that Freemasons copy and very few Masons are ignorant of the fact. Pagans took advantage of the allurement of secrecy to attract the gullible and because their lewd and licentious practice could not bear the light of public witness. The references to meeting places in the initiatory "work" of the first degree of Masonry is very significant. It states, "Our ancient brethren met on high hills or low vales. Why? The better to guard against the approach of cowans and eavesdroppers ascending or descending." This is not what Christ did. He let them hear, but they could not understand because of the hardness of their hearts. But this is exactly what the pagans did -- worshipping atop high hills or in ttre depths of valleys! Read what God says about it in Jer. 2:20-23 and II Kings 17:9-11. Freemasonry uses secrecy to accomplish much the same that the ancient pagans did. While they do not practice sexual immoraIity in their meeting, their foolish eccentricities cannot bear the light of public observance, and the gullible are attracted to their ranks by promises of secret enlightenment. Furthermore, they accomplish the exclusive nature of the Lodge by its use, and are able to profitably exchange their "brotherly love" among the initiated. Their claim that they use secrecy to keep from being a part of "this world" is quite absurd. Masons take an active part in government, politics, economics, law enforcement and any other department of this world's society. Their attempt to explain away their purpose for secrecy in this rnanner only demonstrates their ignorance of what God meant when He said that we must come out of this world and be separate. Masonic teachings and practices are not as wholesome and perfect as they had been led to believe. among Christian nations, was quoted often to show divine sanction. The Lodge seemed beyond question. It was truly a shocking awakening to some to find Lodge teachings and practices of pagan -- not Christian -- origin. Some are not yet convinced that ALL Masonry is pagan even though it has been proven that its oaths are anti-scriptural and that its secrecy is like-wise contradictory to the Bible and pagan in origin. They reason, "If you look hard enough, you can find a little something wrong with any organization. Certainly the other practices and symbols with their allegoric meanings are sanctioned by God's word!" He did not find this in the Bible! The sun and the moon are important Masonic symbols, just as they were tn the old Babylonian mysteries! This doctrine concerning them comes from ANCIENT SUN WORSHIP. The offspring, a blazing star, is of Egyptian origin -- that same offspring which has been worshipped by pagans for generations under many different names, one of thdem being Horus, another Anubis. The lodge room is supposed to be a true representation of King Solomon's temple. Since the temple built by Solomon faced east and west, the Masonic Lodge is supposed to face east and west. The "Worshipful Master's" station is in the east, the Senior Warden in the west, the Junior Warden in the south. God's temple (often referred to as King Solomon's temple) faces east. Why? Because Christ's coming, at the time He enters the new temple, will be from the east toward the west (see Matt. 24:27). The over-all account of this is found in Ezekiel 43. "Afterward he brought me to the gate, even the gate that looketh toward the east: And, behold, the glory of the God of Israel came from the way of the east; and his voice was like a noise of many waters; and the earth shined with his glory ... And the glory of the Lord came into the house by way of the gate whose prospect is toward the east. So the Spirit took me up, and brought me into the inner court; and behold, the glory of the Lord filled the house. And I heard him speaking unto me out of the house; and the man stood by me. And He said unto me, 'Son of man, the place of my throne, and the place of the soles of my feet, where I will dwell in the midst of the children of Israel for ever, and my Holy Name the house of Israel shall no more defile.'" 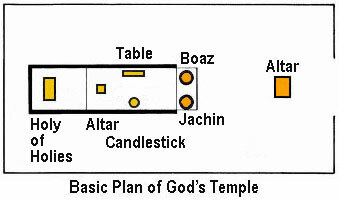 Now study the arrangements of the Tabernacle, which is a shadow, or type of God's throne in heaven, the general arrangement of which was reproduced in the temple built by Solomon. Contrast it with the Masonic Lodge. While there is some similarity in form, they are exactly opposite in arrangement. 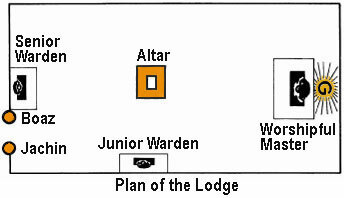 The entrance to the temple is in the east, In the Masonic Lodge it is in the west, The Holy of Holies, where God's presence was manifest is in the west in God's temple. 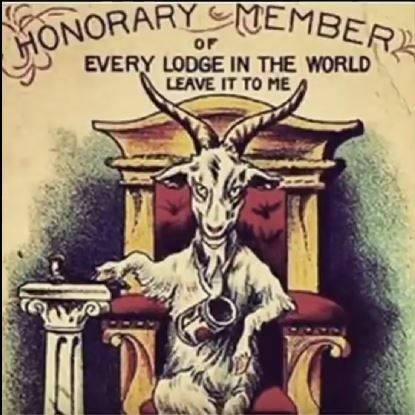 The "Wor- shipful Master" whose seat is under the "G" to represent "god" is in the east of the Masonic Lodge. The Masonic Lodge, therefore, represents a pagan temple which symbolizes this universe. The setting being the earth covered by a "canopy of clouds and the starry heavens," where these pagans worship the sun, which they call the father of all living; the moon which they call the mother; and all the starry hosts of heaven. They hope to ascend into this heaven by means of a ladder which Masons call "Jacob's Ladder," but which the pagans called by other names. If one visualizes this Masonic temple in its true symbolic meaning, they see that it is actually outside THE TEMPLE of God as demonstrated by the placement of the two pillars Jachin and Boaz. The only places in the Bible where these two pillars are mentioned by name are 1 Kings 7:21 and 11 Chronicles 3:17. Here the pillars are described as sitting in the porch of the temple with Jachin on the right and Boaz on the left, as they would be viewed from God's throne. The latter is borne out and made clear by the Jewish and the Revised Standard translation of the Bible which render it as Jachin in the south and Boaz in the north. Masons have these reversed by placing the pillar they call Jachin on the right as you enter their temple and Boaz on the left. The only way a person could pass through the pillars of the temple of God so that Jachin was on his right and Boaz on his left would be when leaving the temple (going away from God). On the other hand, this happens only when entering the Masonic temple. When one pictures Masons in this situation, he cannot help but remember Ezekiel 8:15 where God points out to Ezekiel the WORST OF THE ABOMINATIONS -- "And he brought me into the inner court of the Lord's house, and behold, at the door of the temple of the Lord, between the porch and the altar were about five and twenty men, with their backs toward the temple of the Lord, and their faces toward the east; and they worshipped the sun toward the east." This is exactly what the Masons are doing. Is it possible that the future fulfillment of this prophecy will take place when some Jewish Masons will be in the temple of God and will actually turn their backs on Him to worship other gods? The Masonic ladder, introduced to the candidate in the lecture of the first degree as having three rounds -- faith, hope and charity -- is only for the novice. Masons use other "Jacob's Ladders" with greater numbers of rounds and with different names in the lectures of the higher degrees. One has seven rounds and is also supposed to reach to heaven. The first round (or gate) was made of lead and represented Saturn because of the "heavy nature" whereof his "dull slow progress" was symbolized. The second, of tin, was that of Venus, symbolizing her "soft splendor" and "easy flexibility." The third, of brass, was that of Jupiter, emblematic of his "solidarity" and "dry nature." The fourth, of iron, was that of Mercury, expressing his "indefatigable activity" and "sagacity." The fifth, of copper, was that of Mars, expressing his "inequalities" and "variable nature." The sixth, of silver, was that of the moon. The seventh, of gold, that of the sun. (Morals and Dogma, p. 414.) 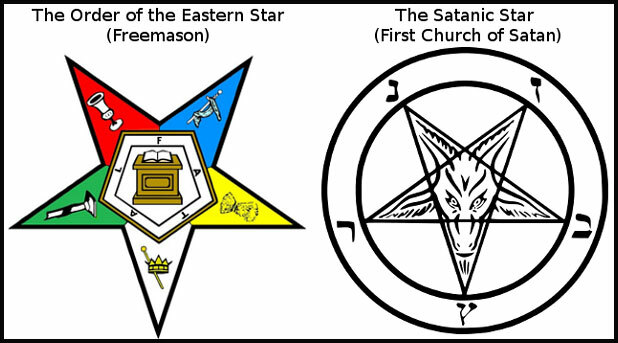 Needless to say this doctrine comes from the ancient pagans, and if we take its symbols literally, it means that Masons attempt to reach heaven by means of honoring these pagan gods and being aided by them along the way. "For thou (Lucifer) hast said in thine heart, I will ascend into heaven, I will exalt my throne above the stars of God" (Isa. 14:13).